US Impotence and Russia’s Intervention in Syria: A Watershed Return to International Diplomacy? The end of the Cold War was welcomed as a new era of peace and security in which swords would be transformed into plows, former enemies into friends, and the world would witness a new dawn of universal love, peace and happiness. Of course, none of that happened. What happened is that the Anglo-Zionist Empire convinced itself that it had “won the Cold War” and that it now was in charge. Of the entire planet, no less. And why not? It had built anywhere between 700 to 1000 military bases (depending on your definition of “base”) worldwide and it had split up the entire globe into several areas of exclusive responsibility named “commands”. The last time any power had mustered the megalomania needed to distribute various parts of the planet to to different commands was the Papacy in 1494 with its (in)famous “Treaty of Tordesillas”. And to make that point abundantly clear, the Empire decided to make an example and unleashed its power against tiny Yugoslavia. Yugoslavia, a founding member of the Non-Aligned Movement was viciously attacked and dismembered, creating an immense wave of refugees, mostly Serbs, which the democratic and civilized world chose to ignore. Furthermore, the Empire unleashed yet another war, this time in Russia, which pitched the semi-comatose Eltsin regime against what would later become a key part of al-Qaeda, ISIS and Daesh: the Wahabis in Chechnia. Again, many hundreds of thousands of “invisible refugees” resulted from that war too, but they were also largely ignored by the democratic and civilized world, especially the ethnic Russians. It took Russia a full decade to finally crush this Wahabi-Takfiri insurgency but, eventually, Russia prevailed. And by that time, the AngloZionists had turned their attention elsewhere: the US and Israeli “deep states” jointly planned and executed the 9/11 false flag operation which gave them the perfect excuse to declare a “global war on terror” which basically gave the AngloZionists a worldwide “license to kill” à la 007, except that in this case the target was not a person, but entire countries. We all know what followed: Iraq, Afghanistan, Philippines, Somalia, Ethiopia, Somalia, Sudan, Yemen, Mali, Pakistan, Syria, Libya, the Ukraine – everywhere the US was at war, whether officially or covertly. The spectrum ranged from an (attempted) complete invasion of a country (Afghanistan) to the support of various terrorist groups (Iran, Syria) to the full financing and management of a Nazi regime (the Ukraine). The US also gave full support to the Wahabis in their long crusade against the Shia (KSA, Bahrain, Yemen, Syria, Iran). What all these wars had in common is that they were all completely illegal – the US and any ad hoc “coalition of the willing” became an acceptable substitute for the UN Security Council. Here again it is important to remind everybody – especially those Muslims who rejoiced at the bombing of the Serbs – that this all began with the completely illegal destruction of Yugoslavia followed by an even more illegal bombing of Serbia. Of course, the Empire also suffered from a few humiliating defeats: in 2006 Hezbollah inflicted on Israel what might well be one of the most humiliating military defeats in modern history while in 2008 a tiny force of truly heroic Ossetian fighters backed by a comparatively small Russian military contingent (only a small part of the Russian military was involved) made mincemeat of the the US-trained and US-funded Georgian military: the war was over in 4 days. Still, by and large, the first decade of the 21st century saw a triumph of the law of the jungle over international law and a full vindication of the age old principle of “might makes right”. Logically, these were also the years when the US diplomacy basically ceased to exist. The sole function of US diplomats remained the delivery of ultimatums “comply or else…” and the Empire simply stopped negotiating about anything. Seasoned and sophisticated diplomats like James Baker were replaced either by psychopaths like Madelaine Albright, Hillary Clinton and Samantha Power, or by mediocre non-entities like John Kerry and Susan Rice. After all, how sophisticated must one be to threaten, bully and deliver ultimatums? Things got so bad that the Russians openly complained about the “lack of professionalism” of their US counterparts. As for the poor Russians with their pathetic insistence that the norms of international law must be observed, they looked hopelessly passé. I won’t even mention the European politicians here. They were best characterized by the Mayor of London, Boris Johnson, who called them “great supine protoplasmic invertebrate jellies‘. But then, something changed. Dramatically. Suddenly everything went south. Every single US victory somehow turned into a defeat: from Afghanistan to Libya, every US ‘success’ had somehow morphed itself into a situation where the best option, if not the only one left, was to “declare victory and leave”. This begs the obvious question “what happened?”. The first obvious conclusion is that the US forces and their so-called “allies” have very little staying power. While they are reasonably skilled at invading a country, they then rapidly lose control of most of it. It is one thing to invade a country, but quite another to administer it, nevermind rebuilt it. It turns out that US-led “coalitions of the willing” were unable to get anything done. Second, it became obvious that the enemy which was supposedly defeated had really only gone into hiding and was waiting for a better time to come back with a vengeance. Iraq is the perfect example of that: far form being really “defeated”, the Iraqi Army (wisely) chose to disband itself and come back in the shape of a formidable Sunni insurrection which itself gradually morphed into ISIS. But Iraq was not an isolated case. The same happened pretty much everywhere. There are those who will object and that that the US does not care if it controls a country or if it destroys it, as long as the other guy does not get to “win”. I disagree. Yes, the US will always prefer the destruction of a country to an outright victory of the other side, but this does not mean that the US does not prefer to control a country if possible. In other words, when a country sinks into chaos and violence this is not a US victory, but most definitely a US loss. What the US missed is that diplomacy makes the use of force much more effective. First, careful diplomacy makes it possible to build a wide coalition of countries willing to support collective action. Second, diplomacy also makes it possible to reduce the number of countries which openly oppose collective action. Does anybody remember that Syria actually sent forces to support US troops against Saddam Hussein in Desert Storm? Sure, they did not make a big difference, but their presence gave the US the peace of mind that Syria would at least not overtly oppose the US policy. By getting the Syrians to support Desert Storm, James Backer made it very hard for the Iraqis to argue that this was an anti-Arab, anti-Muslim or even an anti-Baathist coalition and he made Saddam Hussein look completely isolated (even when the Iraqis began shooting missiles at Israel). Second, diplomacy makes it possible to reduce the overall amount of force used because “instant overkill” is not needed to show the enemy that you really mean business. Third, diplomacy is the necessary tool to achieve legitimacy and legitimacy is crucial when engaged in a long, protracted, conflict. Finally, the consensus which emerges from a successful diplomatic effort prevents the rapid erosion of the public support for a military effort. But all these factors were ignored by the USA in the GWOT (Global War on Terror) and the “Arab Spring” revolutions which now have come to a screeching halt. This week saw a true diplomatic triumph for Russia culminating in Friday’s multilateral negotiations in Vienna which brought together the foreign ministers of Russia, the US, Turkey and Saudi Arabia. The fact that this meeting took place right after Assad’s visit to Moscow clearly indicates that the sponsors of Daesh and al-Qaeda are now forced to negotiate on Moscow’s terms. How did that happen? As I have been mantrically repeating it since the Russian operation in Syria began, the Russian military force actually sent to Syria is very small. Yes, it is a very effective one, but it is still very small. In fact, the members of the Russian Duma have announced that the costs of the entire operation will probably fit in the normal Russian Defense budget which has monies allocated for “training”. However, what the Russian have achieved with this small intervention is rather amazing, not only in military terms, but especially in political terms. Not only has the Empire (very reluctantly) had to accept that Assad would have to stay in power for the foreseeable future, but Russia is now gradually but inexorably building up a real regional coalition which is willing to fight Daesh on the same side as the Syrian government forces. Even before the Russian operation began, Russia had the support of Syria, Iran, Iraq and Hezbollah. There are also strong signs that the Kurds are basically also willing to work with Russia and Assad. On Friday it was announced that Jordan would also coordinate some as of yet unspecified military actions with Russia and that a special coordination center will be set up in Amman. There are also very strong rumors that Egypt will also join the Russian-lead coalition. There are also signs that Russia and Israel are also, if not working together, at least not working against each other: the Russian and Israelis have created a special line to directly talk to each other on a military level. The bottom line is this: regardless of the sincerity of the different parties, everybody in the region now feels a strong pressure to at least not look opposed to the Russian effort. That, by itself, is a huge triumph for Russian diplomacy. The current situation is, of course, totally unacceptable for the Global Hegemon: not only has the US-lead coalition of 62 countries managed to conduct 22,000 strikes with nothing to show for it, but the comparatively smaller Russian coalition has managed to completely displace the Empire and negate all its plans. And the most formidable weapon used by Putin in his proxy war with the USA was not even a military one, but simply speaking the truth. The US does treat all its allies as “vassals” (see Valdai speech) and the US is the prime culprit for all the terrible crises the world now has to face (see UN speech). What Putin did is basically say “the Emperor is naked”. In comparison, Obama’s lame speech was comically pathetic. What we are witnessing now is an amazing turn around. After decades marked by the “might makes right” principle advocated by the USA, suddenly we are in a situation where no amount of military might is of any use to a beleaguered President Obama: what use are 12 aircraft carriers when you personally look like a clown? After 1991 it appeared that the only superpower left was so powerful and unstoppable that it did not need to bother itself with such minor things like diplomacy or respect for international law. Uncle Sam felt like he was the sole ruler, the Planetary Hegemon. China was just a “big Walmart”, Russia a “gas station” and Europe an obedient poodle (the latter is, alas, quite true). The myth of US invincibility was just that, of course, a myth: since WWII the USA has not won a single real war (Grenada or Panama do not qualify). In fact, the US military fared even much worse in Afghanistan that the under-trained, under-equipped, under-fed and under-financed Soviet 40th Army which, at least, kept all the major cities and main roads under Soviet control and which did some meaningful development of the civilian infrastructure of the country (which the US is still using in 2015). Nevertheless, the myth of US invincibility only really came crashing down when Russia put a stop to it in 2013 by preventing a US assault on Syria by a mix of diplomatic and military means. Uncle Sam was livid, but could do nothing about besides triggering a coup in Kiev and an economic war against Russia, neither of which have succeeded in their goals. 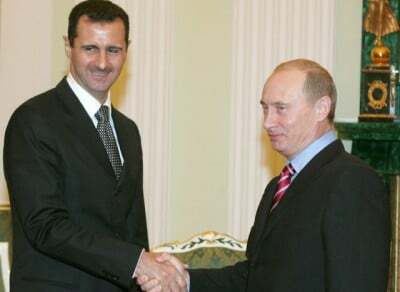 As for Putin, instead of being deterred by all the US efforts, he invited Assad to Moscow. This week’s visit by Assad was nothing short of extraordinary. Not only did the Russian succeed in getting Assad out of Syria and to Moscow and then back without the bloated US intelligence community noticing anything, but unlike most heads of state, Assad spoke face to face to some of the most powerful men in Russia. Normally, heads of state do not meet personally with men like Fradkov or Patrushev and, instead, they send their own experts. In this case, however, the topic discussed was important enough to 1) get Assad personally to the Kremlin and 2) get all the top players in the Kremlin around the same table for a personal discussion with Assad. Obviously, not a word came out from this meeting, but there are two main theories circulating out there about what was discussed. The first theory says that Assad was told in no unclear terms that his days were numbered and that he would have to leave. The second one says the exact opposite: that Assad was brought in to signal to him, and the US, that he had the full support of Russia. I don’t believe that either one of these is correct, but the second one is, I think, probably closer to the truth. After all, if the goal was to tell Assad that he had to go, a simple phone call would have been enough, really. Maybe a visit by Lavrov. As for “backing Assad”, that would go in direct contradiction with what the Russians have been saying all along: they are not backing “Assad” as a person, although they do recognize him as the sole legitimate President of Syria, but they are backing the right of the Syrian people to be the only ones to decide who should be in power in Syria. And that, by the way, is something that Assad himself has also agreed to (according to Putin). Likewise, Assad has also agreed to work with any non-Daesh opposition forces willing to fight against Daesh alongside the Syrian military (again, according to Putin). a) military component: Daesh must be crushed. b) political component: Syria will not be allowed to fall under US control. Still, it is way too early to celebrate. The Russians cannot do it all by themselves, and it will be incumbent upon the Syrians and their allies to fight Daesh, one small town at a time. Only boots on the ground will really liberate Syria from Daesh and only true Islam will be able to defeat the Takfiri ideology. This will take a time. Furthermore, it would be irresponsible to underestimate the Empire’s determination and ability to prevent Russia from looking like “the winner” – that is something which the US imperial ego, raised in centuries of imperial hubris and ignorance, will never be able to cope with. After all, how can the “indispensable nation” accept that the world does not need it at all and that others can even openly oppose and prevail? We can expect the US to use all its (still huge) power to try to thwart and sabotage every Russian or Syrian initiative. Still, the recent events are the mark that the era of “might makes right” has come to an end and that the notion that the US is an “indispensable nation” or world hegemon has now lost any credibility. After decades in the dark, international diplomacy and the international law are finally becoming relevant again. It is my hope that this is the beginning of a process which will see the USA undergo the same evolution as so many other countries (including Russia) have undergone in the past: from being an empire to becoming a “normal country” again. Alas, when I look at the 2016 Presidential race I get the feeling that this will still be a very long process.